At only 18 years old, Ronald K. Brown founded Evidence, A Dance Company, out of a desire to tell the stories of the communities around him. 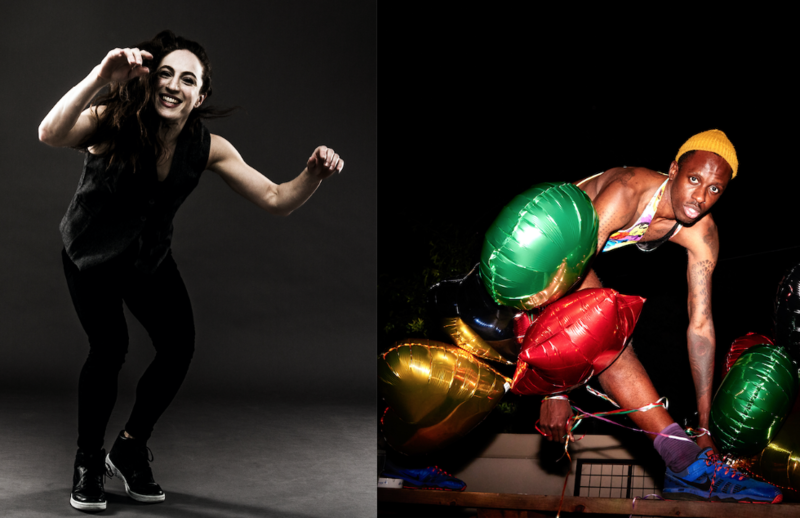 Thirty-three years later, Evidence is now a mainstay in the modern dance world and Brown is a vanguard among choreographers fusing Western modern dance with movement from the African diaspora. In addition to running his own troupe, he's choreographed on such companies as Alvin Ailey American Dance Theater (including 1999's much-beloved Grace) and won an Astaire Award for his choreography on Broadway's Porgy & Bess in 2012. Since becoming artistic director of Miami City Ballet in 2012, Lourdes Lopez has successfully built upon its Balanchine legacy while also embracing Miami's unique cultural identity. She first rose to prominence as a principal dancer with New York City Ballet, performing featured roles in works by George Balanchine and Jerome Robbins. Her wide-ranging career has also included stints as a cultural arts reporter on WNBC-TV, a faculty member at such institutions as Barnard College and Ballet Academy East, the executive director of The George Balanchine Foundation, and a co-founder of The Cuban Artists Fund and of Morphoses. Since creating her company Kidd Pivot in 2002, choreographer Crystal Pite has become a critical darling for her dark, mysterious works that powerfully explore the human condition. Her increasingly ambitious productions, some featuring more than 60 dancers, span dance theater to contemporary ballet. A former dancer with Ballet British Columbia and William Forsythe's Ballett Frankfurt, Pite has created more than 50 works for companies like Paris Opéra Ballet, The Royal Ballet and Cullberg Ballet. Today, she is an associate choreographer of Nederlands Dans Theater, associate dance artist of Canada's National Arts Centre and associate artist at Sadler's Wells in London. As a member of the Paul Taylor Dance Company for 20 years, Michael Trusnovec has commanded the repertory with authority and artistry. He has excelled in roles as diverse as the tormented and tormenting preacher in Speaking in Tongues; the lyrical central figure in Aureole; the dogged detective in Le Sacre du Printemps (The Rehearsal); and the corporate devil in Banquet of Vultures. His work has been honored with a Bessie Award and he was named the Positano Premia La Danza Dancer of the Year in 2016. Having created 26 roles in Taylor premieres, he now serves as company rehearsal director in addition to being one of PTDC's central performers. For the first year ever, Dance Magazine is also presenting a special Leadership Award, which is being given to Nigel Redden. 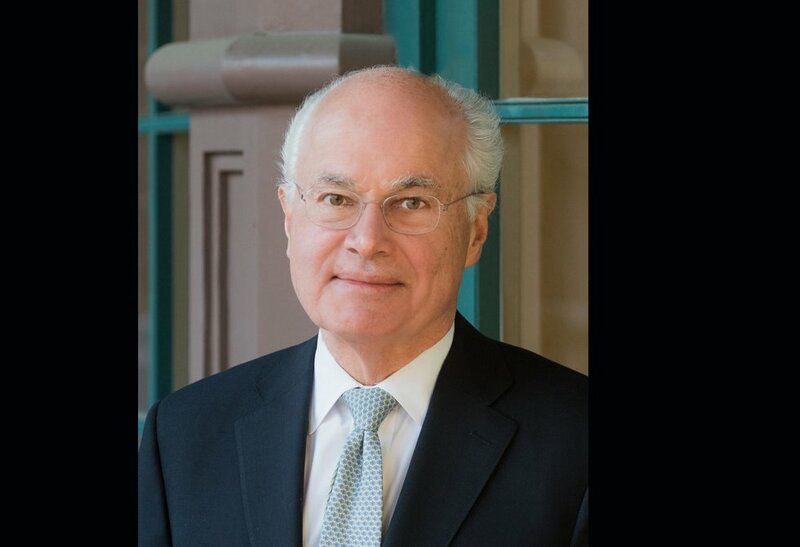 Over the course of his career, Redden's expansive, globalist vision has guided performing arts institutions across the country, from the Walker Arts Center in Minnesota to the Santa Fe Opera. For two decades (1998-2017), Redden served as the director of New York City's wide-ranging Lincoln Center Festival. Today, he continues to direct the Spoleto Festival USA in Charleston, South Carolina, which he has led since 1995. Another new award, The Harkness Promise Award, will shine a light on two young artists for the promise of their artistic work. The inaugural awardees are Raja Feather Kelly and Ephrat "Bounce" Asherie. The Harkness Foundation For Dance received proceeds from last year's Dance Magazine Awards for this grant. The award showcases innovative thinking and how to be an effective artist-citizen who positively impacts dance and the broader community through performance, education, organization and activism. Proceeds from this year's Dance Magazine Awards will be applied to next year's Harkness Promise Awards. A ceremony to celebrate this year's honorees will take place on Monday, December 3 at the Ailey Citigroup Theater in New York City. 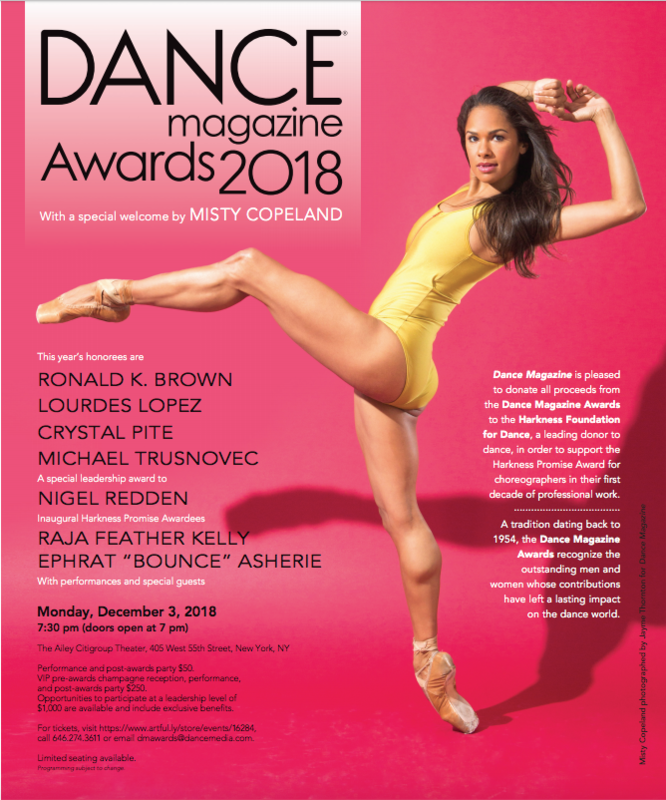 Former Dance Magazine Award winner Misty Copeland will open the event with welcoming remarks. Performances and presentations for each honoree will follow. Tickets start at $50 and can be purchased here or by emailing dmawards@dancemedia.com. For more details, see our press release. You can browse a list of all past recipients here.